Affordable Dental Implants: Your health is an investment, not an expense! When seeking financial advice, many “experts” are bound to advise you on what you should and should not invest in. While some of this investment advice may or may not prove beneficial (depending on who is giving the advice) one investment that’s sure to never be a mistake is investing in your health. Surely most people realize, maintaining your health is absolutely imperative in ensuring not only your future security and productivity, but in preserving your longevity and life quality as well. Although the idea of staying healthy may seem relatively easy based on the outward appearance of our bodies, it’s often what’s going on inside our bodies in which we are unaware. Therefore to truly maintain our general health, it is necessary to understand what’s happening inside our bodies, and what better way to get a glimpse inside then by looking in our mouths? Affordable Dental Implants: Oral health is the key! That’s right! In many ways your oral health can be the key to maintaining your overall general health. Of course if neglected it can lead to serious health problems that may affect your health in numerous ways. As you can probably imagine, much of your oral health revolves around teeth as the function they serve is both demanding and essential in daily life. However if your teeth are damaged or destroyed, getting a tooth replacement is certainly the best course of action, and there are few (if any) better replacement options than an affordable dental implant. Affordable Dental Implants: What are Dental Implants? While you may have heard the term affordable dental implants a time or two before, understanding exactly what they are and how they are used is a bit more complicated. If certain teeth have become damaged or simply just have decayed over time, maintaining proper oral health will likely require these teeth to be replaced. While there are several options available for those in need of tooth replacements, (such as a removable partial denture or a fixed bridge) affordable dental implants for many have become the sought after solution in such a predicament. The dental implant simply put; is a synthetic custom made tooth that is created specifically to replace the natural tooth. 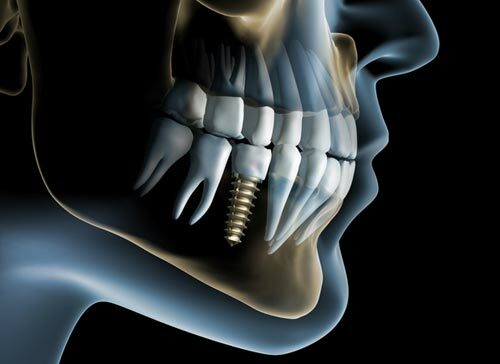 To achieve this, a screw like device known as an implant fixture is placed within the gum via a small incision, thus allowing the implant to be fitted into place, thereby creating a nearly flawless and often permanent replacement. Due to their ability to successfully replace missing teeth, while providing a permanent generally undetectable (implants blend in with natural teeth extremely well) solution, affordable dental implants are considered by practitioners and patients alike as the premier choice for tooth replacement. While dental implants have gained a substantial amount of prominence outside the dental community, unfortunately they have also become somewhat notorious for being expensive and therefore impractical. While it’s true there are cheaper options for replacing missing teeth, remember it’s a good idea to consider a dental implant as something of an investment, as it will likely save you a considerable amount of time and money in the years to come; which is why we refer to them as affordable dental implants. Although removable partial dentures and dental bridges are indeed efficient solutions in some situations, it’s important to realize that eventually they will need to be replaced. Although this may vary depending on how well and how regularly they are maintained. Typically removable partials and bridges have a lifespan of about ten years. However, dental implants require considerably less maintenance and can last a lifetime; a wise investment, indeed. Obviously there is a big difference between these three options, and a major advantage of getting the dental implant the first time. While more expensive at first, in time the affordable dental implant will save you the hassle of performing daily routine maintenance on your dental appliance. In addition to the time savings there is also the cost of having to replace the appliance after several years. As many patients and practitioners agree, the trade-off is typically worth it as the affordable dental implant is not only a much more permanent solution, but it is also much stronger. Thereby more effective than the traditional denture appliances, as the wearer will experience no limitations while chewing and eating any type of food! Remember, you deserve to invest in yourself. In order to maximize your performance and achieve your goals, you need to take care of yourself. As mentioned earlier, taking care of your personal health is perhaps one of the best decisions you can make, and there are few better places to start than with your teeth! So if you have missing teeth, why not invest in the most effective solution possible? Affordable dental implants are not only the most effective option available, but economically they are a worthwhile choice as well. So remember if you’re in need of a tooth replacement, consider investing in the highly effective and state of the art dental implant. Why? Because your worth it! Dr. Charles R. Kimes, DDS and his expert team at Overland Park Dentistry look forward to having the opportunity to help you replace a missing tooth! Or with any preventative, restorative or cosmetic needs you or your family may have. To schedule a dental appointment, contact us at our south Overland Park office at (913) 647-8700 or our north Overland Park office at (913) 341-2380.